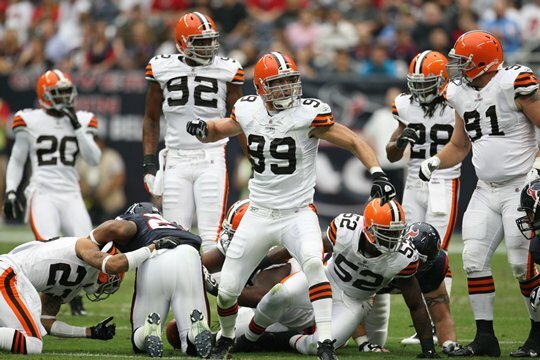 The Cleveland Browns hit the halfway mark of the season after last week’s loss to Houston with a 3-5 record. It would be folly for anyone to say the Browns should have a better record; after all, this is a franchise coming off of consecutive 5-11 seasons and with only 14 total wins over the past three seasons, but the team has certainly left some opportunities on the field. As we are somehow already halfway through the 2011 NFL season, let’s take a look at the Browns with a glass half-full/half-empty take. (in case you missed it, here’s our look at the team at the quarter mark). Half-full: The Browns have the No. 1 pass defense in the league, allowing only 165.2 yards per game through the air. They are fifth in the league in completion percentage (55.1) and in passing touchdowns allowed (9). Half-empty: Why pass when you can run? The team is 30th in the league against the rush, giving up 144 yards per game, 24th in the number of plays of 20 yards or more (9) and 19th in yards per carry allowed (4.4). In three of their last four games, the Browns gave up 151 yards on the ground to Oakland, 174 to San Francisco and 261 to Houston. That’s not trending in a good direction. Half-full: Quarterback Colt McCoy has thrown for 1,764 yards and 10 touchdowns. Those numbers are better – or almost as good – as what Brady Quinn and Derek Anderson combined for in 2009 (2,227 yards, 11 touchdowns). Plus, somehow, McCoy is still in one piece. Half-empty: McCoy is currently a mess. He’s already taken 20 sacks and is only completing 57.5% of his passes. No running game, no reliable receivers and weak line play have made life miserable for McCoy. Half-full: Kicker Phil Dawson is perfect on extra point (11-for-11) and on field goals that have not been blocked (12-for-12). He has also been a ridiculous 6-for-6 on field goals of more than 50 yards – all at the age of 36. Half-empty: Wasn’t this supposed to be the year the Browns thought touchdowns, not field goals? Half-full: The defense is ranked No. 6 overall in the league; Joe Haden has looked good at cornerback (although it seems as if the refs haven’t received the memo yet), D’Qwell Jackson has made a comeback from injuries the past two seasons, and the front four of rookies Phil Taylor and Jabaal Sheard, Ahtyba Rubin and Jayme Mitchell have looked feisty at times. Plus, after only getting 29 sacks all of last year, the Browns have recorded 18 already this season. Half-empty: See those rushing numbers again. Plus, the younger guys on the defense – especially Taylor and Sheard, may be hitting a bit of the rookie wall. Half-full: For the brief time they were healthy, Peyton Hillis and Montario Hardesty looked like they would give the team a running game to take pressure off McCoy. Half-empty: The running game is even worse shape than the passing game, ranking 31st with 82.1 yards per game. The Browns are only averaging 3.1 yards per carry and have just eight runs of more than 10 yards all season. And things aren’t going to get any better any time soon as Hillis and Hardesty are both out this season. Half-full: The Browns have gotten younger, with rookies Taylor, Sheard, Jason Pinkston, Owen Marecic, Greg Little and Buster Skrine; along with second-year players Haden, T.J. Ward and Shawn Lauvao seeing playing time this season. Half-empty: Injuries have forced the Browns to put players on the field perhaps a bit before they are ready – like Pinkston and Lauvao – hopefully that will pay off in the long run. Half-full: The Browns actually doubled their season output for points scored in the first quarter last week against Houston. Half-empty: The Browns have not scored a touchdown in the first or third quarter all season. Half-full: The Browns haven’t actually be losing to patsies. Four of their losses have come against first-place Cincinnati, first-place Oakland, first-place San Francisco and first-place Houston. And it’s not as if the team has been a first-half powerhouse the past two years (1-7 in 2009, 3-5 last year). Half-empty: While this season isn’t about the final record, winning is nice. The Browns should have beat the Bengals in Week 1 and, despite special-teams breakdowns, had a chance late against Oakland. But, as the saying goes, you are what your record says you are. We’ll give coach Pat Shurmur the final word. “As we move forward though in terms of system, in terms of the players that are playing, you’re looking for general efficiency, guys doing more things right all the time whether it’s being their alignment, their assignment, their ability to make a play, you’re looking for guys that are giving great effort on every play and you’re looking for overall team production. That to me is what I will evaluate on whether we’re making improvements. “We’re at the halfway point so that’s typically when you sit and take a little inventory as to where you’re at, but you can’t do too much of that at this point because you’re team constantly changes as to who’s in the game, the team you’re playing and you try to keep your focus on the next opponent.